Between 12th May 2019 and 29th June 2019 this tour will visit 8 venues in Sunderland, Salford, West End, Exeter, West End, Darlington, Dudley and Birmingham. Current and future dates only. This production has already been seen in 19 venues since 23rd April 2018. You can embed this tour information on your own website by adding a single line of code to a page and using the Qtix code T1049729967 - for details see our Embed Information page. 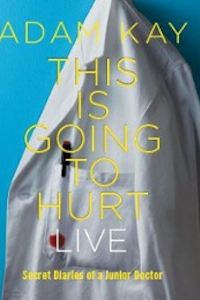 Receive email notifications of changes to Adam Kay - This is Going to Hurt (Secret Diaries of a Junior Doctor).